This one just felt a bit off to me. Probably because I realized going in after being introduced to everyone, I knew who was going to pair off together. So I felt annoyed waiting through the whole book for the characters to figure it out themselves. It didn't help though that we get a random wrench thrown in this one (a character who makes a terrible mistake that impacts another) that didn't seem atypical for this character at all. The book was too fast in wrapping things up I thought. 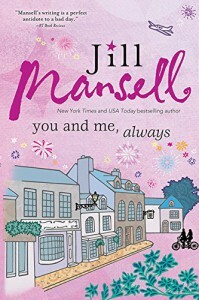 "You and Me, Always" deals with characters living and visiting Stanton Langley. Lily has been raised by a friend of her mother's Coral and her husband since her mother died when she was 8. Lily's two best friends, Patsy and Dan (brother and sister) have all known each other since they were babies. When Lily receives the last letter from her mother on her 25th birthday, it seems to be the kick she needed to get in contact with a man that her mother tells her was the love of her life (Declan). Lily also meets movie star Eddie (hiding out in Stanton Langley) and wonders if this is the man to get her over her decades long crush of Dan. Usually I think Mansell can juggle multiple characters well, but not in this one. I think it's because the stories were sometimes opposed to each other and it felt like we should just be reading stand-alones. We have Coral dealing with being a widow and starting to have feelings for Declan. I found it interesting, but it didn't gel well when we would bounce back to Lily and Patsy. The three women are not really in the same age group so it didn't feel right they were on top of each other so much and didn't seem to have other friends besides each other. Patsy's marriage and bad dating woes were pretty hilarious, but I think Mansell jumped at her getting a HEA and didn't put in enough work for us to be rooting for her or her love interest. I didn't really care about Lily and Eddie, they never did work for me. The writing was typical Mansell, the flow could have been improved though. The setting of this village felt even tinier than I can imagine. Usually Mansell can have me imagine a place and I feel there, this just felt blah to me.